A genuine OE shower filter system from Culligan, the WSH-C125 filtered shower head fits easily onto any 1/2-inch threaded shower arm. Significantly reduces chlorine, sulfur, limescale and bacteria which can contribute to dry skin and damaged hair. Comes complete with everything needed to install easily, no tools required. Five massage settings make this a great addition to your bathroom and a great gift idea! 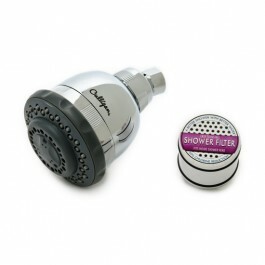 Order the Culligan WSH-C125 filtered shower head today.